After my trip to Hampi, I had a strong incomplete feeling. During my last trip to Northern Karnataka, I missed out important archaeological destinations such as Badami, Aihole and Pattadakkal. Back then, I did not have enough time. Soon after my Hampi trip, I started rigorous planning and study for visiting Badami and the archaeological sites around it . During my trip to Hampi, I was bewitched by the antique temples. I planned to visit Badami, Aihole and Pattadakkal from 5th of July to 10th of July 2016. Usually my husband accompanies me on my trips. But this time, he couldn’t make it due to his business travel. I decided to travel with my mother. In the beginning I was apprehensive about it, but it turned out to be a wonderful experience travelling with her. Thankfully, my generous manager approved 3 days leave and I was all set to start my next archaeological pilgrimage. We started from Bangalore on 5th July 2016 at 4:45pm IST. After getting into a dreadful traffic jam, we reached the railway station just in time. “Golgumbaz Express” is a train that runs between Mysore till Solakpur in Karntaka. It is the ideal train for those who are visiting Badami or Bijapur. I really appreciate the Karntaka government’s policy of scheduling trains between all important tourist destinations with convenient timing. As the train started moving slowly out of Bangalore, I felt so happy and excited. My mother was equally excited as it was our first trip together. After a comfortable journey, we reached Badami railway station at 7:30 am in the following morning. Badami town is approximately 5 km from the railway station. Transfer from the railway station to the town is not difficult as there are a lot of autos(tuk-tuk), mini vans doing service between Badami railway station and town.For a charge of 120 rupees, one auto took us to our hotel Mayura Chalukya. It is a hotel run by Karnataka tourism. It is an old property but it’s location is excellent. All the important attractions in Badami are within 2 km from the hotel. The room was quite disappointing. It was old and congested. The A/C did not work. But the hotel staff was courteous enough to upgrade us to a larger and better room, much to my relief. After a small rest we were ready for the first part of our itinerary. The first stop is the Badami Cave temples. The hotel staff told the Badami cave temples are quite close to the hotel, however we took an auto. I think it was a great decision. Badami is not a clean city to walk around. There are a lot of stray pigs roaming around and the walkways are littered. Also to reach the Badami cave temples, one need to cross the Badami slum area, which is quite untidy. However, as we enter the Badami cave temple complex, it looks like another world. The complex looks so neat and tidy. Archaeological Survey of India(ASI) is maintain this archaeological site with utmost care and sensitivity. Badami cave temples are a group of four rock-cut cave temples with exquisite sculptures. These temples are around 1500 years old and attributed to the Chalukya dynasty. These temples are cut into the side of a huge red sandstone mountain and remains as the finest examples of Indian temple architecture and art. One of them is a Shiva temple, the second and third are Vishnu temples and the fourth is a Jain temple. After purchasing the tickets, we waited for few minutes for our English speaking guide to arrive. Most of the guides in Badami are well versed with Hindi and Kannada. You need to explicitly ask for an English speaking guide. Sometimes the guide claims to speak English, but would only throw in a few English words. So it is better to engage the guide in a small chitchat to measure the English knowledge. Also, Badami cave temple area is notorious for aggressive monkeys. One need to take caution to avoid these troublesome lot. Thankfully our guide “Panchu” – that was his name – was an excellent guy. He was a BA in History and was so passionate about the archaeological sites. He started the tour with a small story to warm up our interest. “Chalukyas” were a powerful dynasty that ruled most parts of North Karnataka from the year AD 544. There is an interesting story behind the genesis of the name “Chalukya”. Once Brahma – one of the supreme God in Hindu trinity – was doing his morning prayers. Indra – the King of Gods visited Brahma with a complaint. He said the people on earth are deviating from faith and have stopped performing religious rituals. Indra wanted Brahma to bring people back to faith and holistic living. Suddenly a great warrior and guru emerged from the water pot of Brahma. This water pot was used for religious rituals and was known as “Chaluka” in Sanskrit. As the warrior emerged from a Chaluka(water pot) he was called “Chalukya”. According to the legends, this is the story of the progenitor of Chalukya dynasty. As we walked towards the first cave temple, our guide explained about the etymology of Badami. According to the ancient inscriptions, Badami was known as “Vatapipura” or “Vatapi”. The name Badami must be a modern and alternate version of “Vatapi”. However, there is another theory. It attributes the name to the almond colored rocks in this area. In Kannada, almond is called “Badam” and the place with red rocks resembling almonds (even in texture) was named “Badami”. 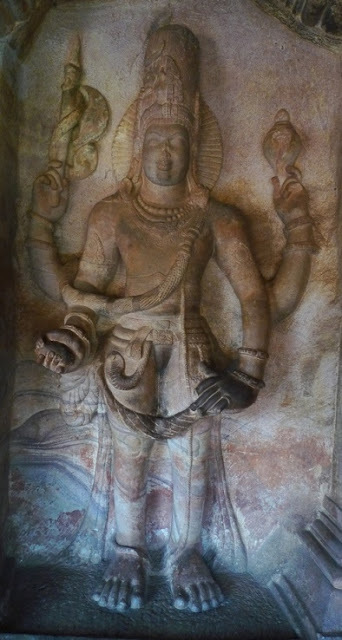 As we entered into the first cave temple, the first notable sculpture is that of an eighteen handed Shiva. Shiva is performing the dance named “Thandava”. Each hand of Shiva is a symbol from the Indian classical dance “Bharatanatyam”. Nandi- Shiva’s vehicle - is at his feet along with the drummers and musicians. There is one drummer on the right side of the Shiva who is of great interest. He is the attendant named “Tandu”. According to Hindu Mythology, Shiva instructed Tandu to teach this dance to Sage Bharata(author of Natya Sastra). Hence this dance took the name “Tandava”. It was a new knowledge to me. The guide also told that by combining one hand from either side of Shiva, one can see 81 distinctive poses of Bharanatyam – A famous south Indian classical dance form. Our guide pointed the complex hairdo of Shiva. It is a characteristic of Badami sculptures. Every figure has a distinctive hair style. There is also the sculpture of “Mahishasura Mardini” – The goddess who slayed the bull shaped demon Mahisha. One thing is noteworthy, how the weapon of the Goddess is piercing through the head of the bull and touching the ground. Such an attention to detail is a specialty of Badami sculptures. Just near the Goddess's sculpture, there is a small figure of Ganesha. Usually Ganesha is depicted with a pot belly, however in this sculpture, he is quite slim. This sculpture is in the form of Vatapi Ganapathi. According to historians, there was a famous idol of Ganesha in ancient Badami known as the “Vatapi Ganapathi”. During the Pallava invasion of Badami under the leadership of great Pallava general Siruthondar , they smuggled this famous idol to Tanjavore – a place now in Tamilnadu. The ancient idol is still present in Uthrapatheeswarar temple of Tiruchenkattankudi temple of Tamilnadu. As we climbed the steps of the first cave temple, we found ourselves in a long corridor with intricately carved pillars. Both ends of the corridor is decorated with a magnificent piece of sculpture. On one side, we have the “Ardhanarishvara”. It is a form that combines Lord Shiva and his consort Parvati. One side is of male form and the other side is female. On closer observation, we can see that the right half has anklet on the leg, other ornaments and a raised bosom. The hairdo and the ear ring of the right side is also different. The right side depicts Parvati. I have seen Ardhanarishvara depicted on the walls many ancient temples. However, one distinctive feature of this grand sculpture is a skeletal figure on the left most side of the sculpture. I wondered how such an austere figure ended up in such a beautiful sculpture. Our guide had a good laugh at my bizarre question. He told that skeletal figure is the central to the theme of the sculpture. He is a sage named Bringi. Bringi was a great Shiva devotee. But he did not have high regard for Parvati as she was a woman. Bringi wanted perform Parikrama or Pradakshina(in Hinduism, the devotee walks around the god in a circle) only around Shiva. Shiva and Parvati combined their bodies to become Ardhanarishvara figure so that Bringi cannot do circumambulation around Shiva. Bringi did not budge, he was so determined to worship only Shiva. This enraged Parvati. She took back from Bringi, all the vital elements that comes from mother. According to Hindu philosophy, the hard parts of the body line bone and nerves comes from the father and the soft parts like flesh and blood from mother. Bringi become a skeletal figure after the curse of Parvati. This incident is described in this magnificent sculpture panel. On the right most side of the panel, we can see a women figure. She is the attendant of Parvati and she is holding a jewel box. According to our guide, this figure is placed in the panel just to maintain the symmetry. Another magnificent sculpture panel in the first cave temple is the Harihara panel. This panel also depicts a similar theme as that of Arthanareeswara. In Harihara Panel, the central figure is a combination of “Hari” means Vishnu and “Hara” means Shiva. In the Harihara form, Shiva and Vishnu are fused to form a single figure. Even though both the halves look same, on closer observation, one can see the on the left hand, the idol has an Axe(“Parasu”) and serpent – symbol of Shiva. On right hand it is “Shanka”(A Conch, symbol of Vishnu). Even the hair do is different. Shiva’s side (left) has a small moon depicted. Shiva has a serpent around the waist and an anklet on his leg, but Vishnu side is different. It is a wonder how the sculptors managed to bring about such a details into one sculpture. Our guide told us that the Harihara form was created to bring about harmony between Vaishnavists and Shaivists (who follow only Vishnu or Shiva respectively) There were two groups who fought bitterly in medieval India. I noticed the highly carved pillars and roof of the temple. There were flying Gandarvas and Apsaras on the roof, so intricately carved. I wondered how much painful it might have been to carve on the roof. It is not straight forward as carving on a wall. Each sculpture has the hand print of the sculptor, along with his blood and sweat. The coiled Nagaraja on the roof is extremely simple yet beautiful. After seeing the Harihara panel, we entered into the interiors of cave temple. One thing that was so odd is that, there were no sculptures or pillar decorations on the inner side of the cave temple. Our guide explained about it. As they are cave temples, sunlight only falls in the first corridor. The inner corridor and sanctum would be in shade most of the times. The sculptors knew that it is not worthwhile making the sculptures inside as, sunlight it is essential for anyone to appreciate the beauty of a sculpture. Thus they saved time and energy and spent it on the magnificent carvings on the front corridor. As we started walking towards the second cave temple, our guide shared some more history of the Chalukya dynasty. Chalukya dynasty originated from two governors of Kadambas. They were Jayasimha and Ranaranga. They were not independent rules, but the rebelled against the Kadambas. The first ruler of Chalukya dynasty is Pulakeshi I. He founded the Chalukya empire in AD 544. He selected Vatapi as his headquarters, mainly due to the secure geography of Vatapi. Vatapi is surrounded by huge red sandstone cliffs on three sides. It would be difficult for any enemy to stealthily approach it. Pulakeshi I also founded a fort on top of the Badami cliffs. The most famous ruler of Chalukya line is the second Pulakeshi. He was the grandson of Pulakeshi I. He defeated his uncle Mangalesha and captured the control of Badami. He was an eminent ruler. He spread the Chalukya dynasty far south towards Maharashtra and east towards Tamilnadu. There was a time when Chalukyas controlled the entire Deccan plateau. However the Chalukya dynasty started disintegrating in the late 8th century AD. Kirthivarman II is the last Chalukya king. In AD 757, the Rasktrakutas conquered Chalukyas and gained control over the major parts of Deccan. It was Chalukyas who laid the foundation stones of south Indian sculptures and temple architecture. All the dynasties who followed took inspiration from the design and architecture from Chalukya temples. We walked towards the second cave temple. It is smaller compared to the first one. Second temple is dedicated to Vishnu. Like the first cave temple, there is a corridor in front of the cave temple, lined by highly ornate pillars. On either sides of the corridor there are huge sculptural panels. One of them depicts the “Varaha Avatar” of Vishnu. In his Varaha Avatar, Vishnu takes the form of a wild boar. There is a slim lady in Varaha’s hands. It is the Goddess earth. According to Hindu mythology an Asura named Hiranyaksha abducted Goddess earth and placed her in abyss. Vishnu in his Varaha Avatar rescued the mother Earth. This sculptural panel describes this story. There is a coiled serpent near the foot of Varaha. It is “Sesha Naga” the attendant of Vishnu. The next panel is of “Trivikrama”. It is also another Avatar of God Vishnu. This story is related to a generous Asura King named Mahabali. King of Gods Indra was jealous of the prosperity of King Mahabali and implored Vishnu to eliminate Mahabali. Vishnu took the form of a young Brahmin sage and requested Mahabali to grant him 3-foot land for doing his penance. Mahabali readily agreed. The moment Mahabali promised this, Vamana grew into a gigantic form – Trivikrama. With his 2 foot Trivikrama measured earth, abyss and sky. He asked Mahabali – “Where should I place my third foot?” Mahabali was true to his word. He showed his head and prayed Vishnu to place his foot. This is the situation depicted in this sculpture panel. There are also many sculptures on the roof of the second cave temple. One of them is of special interest. It is an infinite maze. There is not starting and ending point for this maze. Also there are sculptures depicting the churning of the milky ocean. As I climbed the stairs leading to the third cave temples, I found myself in a spacious courtyard. Looking down from this point in the hill, one can see a panoramic view of the Agastya lake and the red sandstone cliffs of Badami. It was a lovely view. Agastya is an artificial lake, which is very ancient. Historians believe that the Chalukyas themselves had dug out the Agastya lake and built the stone steps leading to it. Our guide also told that Chalukya workmen reused the stone pieces that was carved out while creating the cave temples to build these steps. From this courtyard, I had a good look at the third cave temple. Third cave temple is the largest and most decorated in the Badami cave temple group. Historically this temple is very important as there is an inscription found inside this temple attributing its construction to Mangalesha- the third king of Chalukya dynasty. The year and day of consecration of this temple is also clearly marked. It is equivalent to the full moon day of 1st November in AD 578. In fact, the date was written in Saka year. The first striking sculpture of the third cave temple is located on the eave next to the entrance of the cave temple. It is the sculpture of Garuda. Garuda is an eagle in human form. According to Hindu mythology, Garuda is the vehicle of Vishnu and it is customary of Hindu temples that the vehicle of the main deity is carved just outside the main sanctum. The first corridor of the cave temple so much ornate that it resembles nothing less than a royal court. At one end of this corridor, stand the iconic image of Badami. It is a sculpture of lord Vishnu sitting on top of the coils of serpent “Shesha”. There are no words to describe the beauty of this sculpture. It is also enhanced by the intricately carved pillars on both sides. Next to the Vishnu sculpture, there is also a sculpture of Varaha. It is almost same as the sculpture we saw in the second cave temple. On the other side of the corridor, there is an equally stunning sculptural panel depicting “Narasimha” another avatar of Lord Vishnu. Narasimha is depicted with four hands and heavily leaning on a club, which is broken now. There is also a very clear depiction of Harihara in this cave temple. Apart from these magnificent sculpture panels, the roof and pillars of the cave temple is also decorated with sculptures and decorative carvings. The top portion of the pillars are adorned with sculptures of common people of Badami. Some of the interesting pillar sculptures are below. Carved on to the pillars facing each other, there is a depiction of a royal couple and a working class couple. The financial status of each of these couple is evident from the type of cloths and ornaments. The working class has cloths only till the knees, which enable them to work in the fields. The ornaments of the working class are also very simple. The royal couple is characterized by full length dress, with heavy ornaments including anklets. Their dress seems to be made of fine cloth and embroidered. There is a sculpture of a couple, who seems to be in love. They are spending time in the mangrove. There are smaller figures by the foot of the couple, probably a symbol for cupid. This hilarious sculpture depicts the scene that a woman has passed out after drinking too much of local alcohol and a man (possibly her husband) helping her to get on her feet. She had vomited and there is a dog licking the vomit at her feet. This sculpture was of special interest as it also shows the cultural setting of olden days Badami. As many sculptures depicts, women had a very strong presence in the daily life and temple activities. The sculptural panels on the ceiling of the third cave temple are also very interesting. They depict Brahma, Kubera, Varuna, Shiva-Parvati, Indra etc. Another striking feature of the third cave temple is that, it had mural paintings all over the walls. Unfortunately, due to lack of protection they have all vanished. Our guide told that in the early days of discovery of this temple, chemical wash was performed to clean the temples, and much of the destruction of the murals are attributed to this unscientific act. If the mural existed, then the cave temple 3 would have been nothing less than a world wonder. There is some color left on some parts of the murals. Also, in the archaeological museum of Badami, there is reconstruction of the Badami cave murals. It is indeed a disappointment for any art lover. There stone inside this temple is naturally adorned with purple veins running along them. It is the specialty of only this cave temple. Our guide is of the opinion that, this area of the mountain with such beautifully designed stones might have been reserved for making such a stunning cave temple. The fourth cave temple of Badami is quite different from the others in the group. It is a Jain temple. Even though the Chalukya kings were Vaishnavas, many of their subjects were Jains. Religious tolerance was one of the main principles of Chalukya rulers. So, they created the fourth Jain temple in order to accommodate the Jain population in their Kingdom. However, the fourth cave temple is situated inside a high wall. I asked the guide about it. Many of the Jain sages were “Digambars” meaning, they were practicing nudism. So, it might be uncomfortable for the Hindu religious if they happen to see these Jain sages. Also vice versa. Hence it was thoughtful on the part of Chalukya kings to include this high wall in their construction. The fourth cave temple is much smaller than the third one. The primary deity of the fourth cave temple is Mahavira. As we enter into the cave temple, on the right side there is a sculpture of Parshwnatha – the twenty second Thirthankara of Jainism. He is identified by the five hooded serpent over his head. In the sanctum, there is an idol of Mahavira. Mahavira was the last Thirthankara of Jainism. According to Jain beliefs, a Thirthankara is a great teacher. He is identified by seating position and triple parasol over his head. There is also a magnificent sculpture of Bahubali – a Saint in Jainism. During my visit to the fourth cave temple, I came to know about a ritual in Jainism named “Santhara” or “Sallekhana”. It is kind of a fasting unto death. The devotee who enters the “Santhara Vrutha” doesn’t take any food or water and believe to attain Moksha. There was a huge controversy over this ritual as Rajasthan High court banned it. The court sited that this ritual is equivalent to suicide. However later on, Honorable Supreme court of India removed this ban. There is an image of a lady in the fourth cave temple, who has believed to attain Moksha by performing “Santhara”. It was almost 3 hours we were roaming around in the cave temples. Our guide did a great job explaining us the archaeological and religious importance of the Badami cave temples. He charged five hundred rupees for 3 hours. However, I felt that it was worth every penny. I walked around an clicked a few photos of the Agastya lake and that of the Lower Shivalaya as seen from the Badami cave temples. Thankfully, none of the monkeys took particular interest in us. We bid goodbye to the cave temples by noon and proceeded with the next items in our itinerary. Beautiful images, you must be fast enough to capture em all. Fantastic! well written with beautiful pictures... after reading this, I would plan to visit this place.